The NSF Finder is a network based tool which allows finding NSF files from all the machines connected to a network. Software will list the entire NSF files present within each machine that is connected to the same domain. Later, you can copy and save listed NSF files on your local machine. In order to perform NSF file search within a network domain, you need to first provide its credentials. The software will prompt you to provide the domain username and password. After this, it will list all the machines present on that network along with the respective NSF files within. Search All Drives: The software will search all the drives from each machine. Search in Specific Drive: Select a specific drive and software will only search within the chosen drive of the machine. After viewing the located NSF files, software allows you to copy and save them at a safer location. It is possible to copy selective NSF files and save them on your machine at any desirable location so as to keep them all at a common location for future use. It is also possible to copy the NSF files of selective machines from the network. The list of NSF file generated after searching within machines is possible to be saved in CSV format file. The software generates a complete list of all NSF files with details like: name of machine, file name, file path, and its size in GB. Now, if you export this data in CSV, you can easily use this information or record in future to find the location of a specific NSF file. In order to locate and save NSF files available on the machines under same network; users only need to provide the user name and password of each machine. After this, the software will automatically list and show the location of NSF files found within the network. Demo version of NSF Finder software will give the preview of NSF files discovered from the machines under same network. Is this software compatible with Windows 8 machine? Yes, software is fully compatible with latest Windows 8 OS. You can install and run the software on any Windows OS edition without troubles. I want to search all NSF files within a network group. How can I do this? 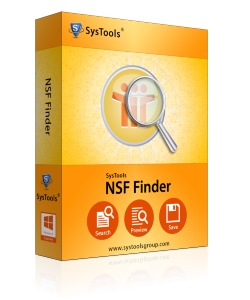 SysTools NSF Finder tool searches list of stored NSF files in all machines of a single domain, workgroup or network. Ensure that that all machines are connected to a single domain and the user must have admin rights on that network and should know its login credentials. Does software require Lotus Notes installation to work? No, NSF Finder is a standalone tool and does not require Lotus Notes installation for its functioning. It will work smoothly even if Lotus Notes is not installed on the respective system. Can I find NSF files even without knowing the domain credentials? No, you need to know the domain credentials and should have full admin rights on the network to use this software. Does software allow saving NSF file on local machine? Yes, licensed version of the NSF Finder tool will let you save all/selected NSF files on your local machine. What attributes of NSFfile does software show after searching? After searching all NSF files on multiple machines of same domain, software will give preview of stored NSF files for a single selected machine with attributes like; machine name, NSF file path and size of NSF file. You can save this information in a CSV format file on your local machine. The tool seemed right at first, but I didn't want to save the files on the very moment due to less storage space on my local machine. Saving the details in a CSV format file helped well in handling the situation the way I wanted. Thank you SysTools! Thought there were many systems connected to our organization's domain, I just wanted to extract files from a few of them. Thankfully the tool offers an option for selective file saving from machine of user's choice. It was a nice experience working with the tool.